William Hill launched their first Cheltenham Festival offer for the 2018 edition! 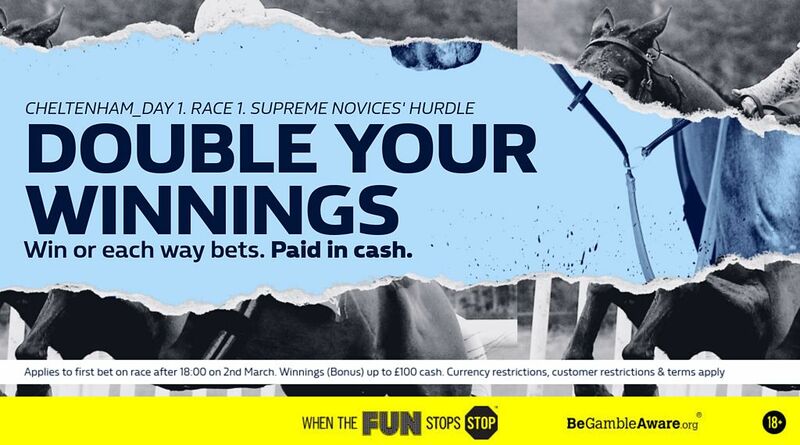 Get double winnings should your horse win or place in the opening Supreme Novices' Hurdle up to a value of £100 (paid in cash), plus £30 in free bets as soon as you stake £10! The Supreme Novices' Hurdle traditionally gets the Cheltenham Festival underway. The race is considered to be the most prestigious 2 mile hurdle race for Novices of the season. The race has been dominated by Willie Mullins with three wins from the last five years but last season's edition was won by the 25/1 shot Labaik under young jockey Jack Kennedy for trainer Gordon Elliott. Wanna make double profits on your win or each way bets? Find here what William Hill is offering this year! 3. 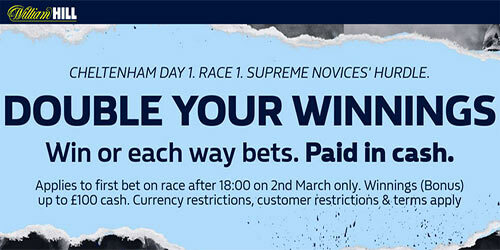 If your horse wins or finishes in the first 3 places, William Hill wil double your winnings up to £100 cash! Applies to first bet on race only. Winnings (Bonus) up to £100 cash. Currency restrictions, customer restrictions & terms apply. 4. Furthermore, you will receive a £30 welcome bonus as soon as you place your £10 bet! You will be credited 3x £10 free bets to your account. That's £30 in free bets plus a chance to double the winnings the opening race of the 2018 Cheltenham Festival, which gives a perfect opportunity to build up a betting balance for the remainder of the festival. Sign up to William Hill today and get a free bet up to £30! Just place a bet of £10 and get £30 free credited as 3 x £10 free bets! Applies only to 1st bet on the 2018 Supreme Novices' Hurdle, placed between 18:00 on 2nd March and the start of the race. Only Win and Each Way singles are valid, from desktop and mobile. Winnings from 1st bet will be doubled (after deduction of your initial stake) should your horse wins or finish in the top 3. Maximum bonus is £100, paid as cash money. If you Cash in your bet you will not qualify to receive the bonus. Full terms apply. Gamble Responsible. Guaranteed Profit on the Ryanair Chase! William Hill will put £5 bet on the winner for you! "William Hill Double Winnings on the Supreme Novices 2018"